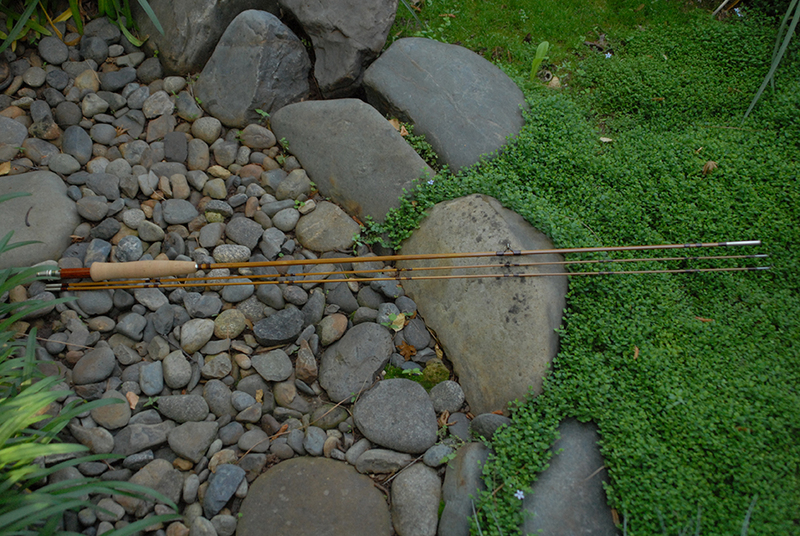 I lean toward building the faster bamboo rod because I enjoy fishing them, though I can make any taper (action) you prefer. We will determine which rod taper will fit your casting style and fishing preferences. 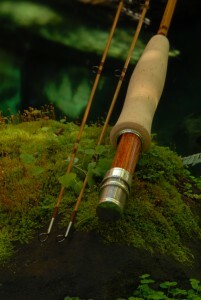 Then you will choose the various rod options (see Rod Components) to create a truly unique and personal lifelong fishing companion you will enjoy the rest of your life, and will become treasured family heirloom. Rod builders recommendations are just that, recommendations, and they are only “correct” in the abstract. Even when a standardized method is used to determine line weight guidelines (for example, a specific weight producing a certain amount of deflection), personal casting style/preference will change the equation. 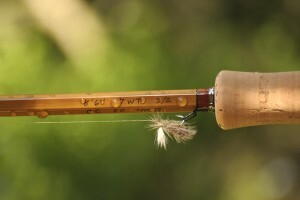 Casting styles aside, a given rod might perform best with different line weights depending on the job at hand (fishing distance, added weight, fly size, wind, etc.). Even line “weight” is variable because it is usually based on a range of weights for a given number designation and is distributed differently over the same length in different lines. Several people can cast the same rod, and each person could have a different opinion of how the rod feels. Your casting style and what you are most familiar with using, will determine what feels right to you. I keep a prototype of most of my models at my shop, and they are available to cast. All rods are built with Hexagon Construction for proven strength and symmetry. All rods come with 2 matching tips, not because they break easy, they don’t, it’s just a tradition thing. All 2 piece 2 tip rods are $1250 with any of the options listed here. Many clients tell me I should raise my prices (only after they have purchased theirs though). Maybe some day I will, but now I just enjoy making bamboo rods too much to risk being idle, I would rather stay busy making them, then scare away bamboo enthusiasts by asking ridiculous prices. But if you want to go Gonzo on the components we may have to talk pricing. 7042 7ft. 4 wt. 2 piece – Based on the classic “Payne 98”, a fast four weight DT or a 5 WF. 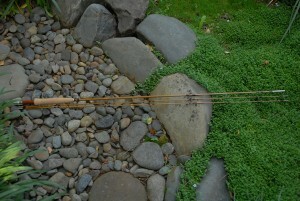 A wonderful dry fly rod for small to medium streams. The Payne 98 Remains One of Payne’s most Celebrated and Best Known Models. 7652 7ft. 6inch 5 wt. 2 piece – A nice med-fast action rod based on the 100H The typical all-around rod. This model is a rod to take just about anywhere, and find it a pleasure to fish with. Smooth is the byword here unhurried but not slow. The first rod choice of many fishermen who enjoy a spirited action without it being clubby or overbearing. It is just a very smooth casting rod. 8052 8ft. 5wt. 2piece – Nice fast 5 weight The 8013 is one of those rods that always come up in conversations, an impressive and powerful med/fast action all-round trout fishing rod. A powerful rod for bigger water. 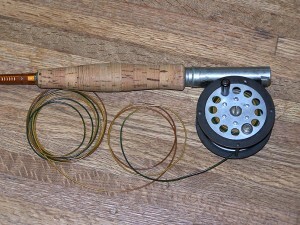 Great all around trout rod with a little extra length for mending and plenty of backbone for the bruisers. Remake of the Dickerson 8013 This rod is delicate enough to handle small flies and fine tippets and has more than enough power for larger flies. 8062 8ft. 6 wt. 2 piece – The bigger brother of the 8013. Faster action and a more powerful rod. Handles windy conditions great. This 6wt is a true powerhouse – suitable for big rivers, big trout and big flies. A rod that can handle bigger fish better than the 8013. A rod that is great for streamers, fishing brown drakes and hex flies without having to struggle. Based on the Dickerson 8014 taper this rod displays authority and command, Medium-fast + action This powerful rod handles windy conditions great. 8652 8ft. 6inch, 5/6wt. 2 piece – Here again a remake of a Dickerson taper the “8614” An 8Ft. 6inch rod that can handle bigger fish better than the 8013 and with tad more length. A rod that is great for large lakes and bigger fish, streamer and big air resistant dry flies without having to work the rod (or your arm) too much. Its medium fast action displays authority and command, Handles windy conditions great. All 3 piece 2 tip rods are $1450 for the same reasons that the 2 piece rods are $1250 with the same exclusions. 8053 8ft. 5wt. 3 piece – A rod for all situations. This modified Dickerson taper is a nice compact, easy to carry 3 piece rod. It is beefy enough to handle larger fish, and is equally at home on large rivers and small streams, long enough to fish from a canoe or belly boat. This rod will throw a full line in the right hands. Yet is sensitive, with a light tippet protecting tip. And one of the best roll casting rods I have used. I don’t like to have to carry more then 1 rod, or have to think which rod to use. All I have to do is grab this 8053 The ultimate all around rod, My personal go-to rod. You have heard about this rod before, you may not remember where but it always comes up in one of those great fishing stories. Not meant for all fishing, but none are. It can be used on large rivers and reach crazy long distances with the added benefit of not wearing you out. It can easily handle all large trout and medium to large steelhead.